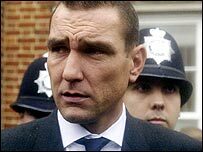 Former footballer Vinnie Jones says the charity work he has had to do after an "air rage" attack had done him a lot of good. The actor, who lives in Wiggington, Hertfordshire, had to work for 80 hours for a charity after being convicted of an air rage attack. For two weeks he has been working as a driver's mate for a charity based in Hemel Hempstead, helping to carry furniture in and out of homes. "It's been very rewarding and once you get over the shock and the sulks and realise that if you do the crime, you do the time, you get on with it. "What's the point of me walking round with a long face in front of all the staff here - it's not their fault I'm here. "I've just tried to be part of the team." He said his sentence was no soft option. "It's a different world that I've been involved with. My world is full of freedom, if you like. "But doing this has done me a lot of good. "Sometimes you can lose track of your life and you get carried away. This brings you down to earth." The star said he had tried to remain anonymous and intended to stay in contact with the charity. He admits celebrity friends have been ribbing him about his delivery role. "I'm known now as Mr Pickfords - that's what they call me. "Guy Ritchie sent me a message saying can I come down and do a house clearance. "I got back to him and said I didn't have enough lorries." Jones was convicted at a hearing at Uxbridge Magistrates' Court last month which heard he had screamed at fellow passengers on a London to Tokyo flight: "I can get you murdered, I can get the whole crew murdered for £3,000." He also threatened to "eat the face" of a passenger.